Better Births, the report of the National Maternity Review was published in February 2016 and set out a clear vision: for maternity services across England to become safer, more personalised, kinder, professional and more family friendly; where every woman has access to information to enable her to make decisions about her care; and where she and her baby can access support that is centred on their individual needs and circumstances. It also calls for all staff to be supported to deliver care which is women centred, working in high performing teams, in organisations which are well led and in cultures which promote innovation, continuous learning, and break down organisational and professional boundaries. Implementing the vision set out Better Births will support the Secretary of State’s ambition to halve the number of stillbirths, neonatal and maternal deaths and brain injuries by 2030. The Maternity Transformation Programme seeks to achieve the vision set out in Better Births by bringing together a wide range of organisations to lead and deliver across 9 work streams. The programme is led by a Programme Board, supported by a representative group of stakeholders that will scrutinise and challenge decisions made by the Board. Local transformation supported by national enabling action is key to realising the Better Births vision. Providers and commissioners of maternity services have been asked to come together to form Local Maternity Systems, which will plan the design and delivery of services of populations of 500,000 – 1,500,000 people. These Local Maternity Systems will be formed by the end March 2017 and will be supported to put plans in place, by the end of October 2017, to deliver Better Births. Supporting Local Transformation: working in tandem with STP processes, and through NHS Regions and Maternity Clinical Networks, to provide targeted support to local maternity systems. Providing Support for 7 Early Adopters to harness enthusiasm for change and test the model of care described in Better Births. Increasing Choice and Personalisation: working with 7 Maternity Choice and Personalisation Pioneers to test new approaches to widen and deepen choices available for women. 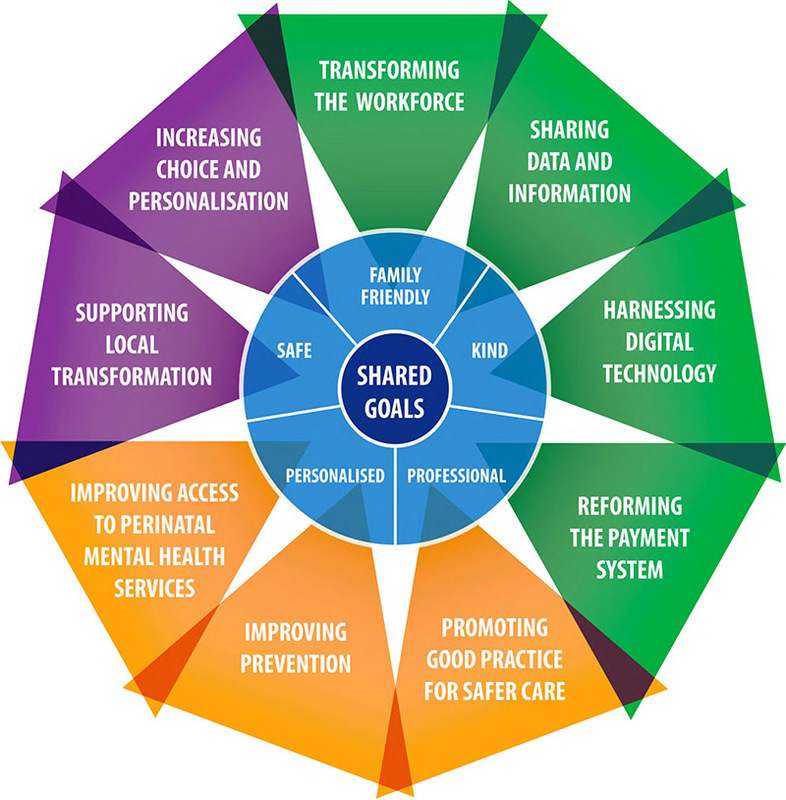 Promoting good practice for safer care: there is much good practice already in the NHS and this work stream aims to ensure widespread dissemination and adoption of best practice, through targeted support to embed a safety, learning and improvement culture throughout NHS maternity services. Improving access to perinatal mental health services: a joint work stream between the Maternity Transformation Programme and the Mental Health Transformation Board. It aims to improve access for women to high-quality specialist mental health care, closer to home, when they need it during the perinatal period. For more information view the NHS Five Year Forward View Mental Health Implementation plan. Improving prevention: Public Health England is leading work to prevent poor outcomes through actions to improve women’s health – before, during and after pregnancy to ensure that families get off to the best start possible. Transforming the workforce: this work stream aims to ensure that we have the right work force with the right skills to implement the vision set out in Better Births, and that the work force is supported to adopt new models of working, including continuity of carer. Sharing data and information: NHS England is working with its partners to identify a consistent set of indicators, for local use to benchmark quality and drive service improvement. Harnessing digital technology: NHS England is working with partner organisations to develop a digital maternity tool and support the roll-out of interoperable digital maternity records. Reforming the payment system: NHS England, in partnership with NHS Improvement will review the existing payment system and make recommendations on any reforms necessary to deliver the proposed new models of care in maternity provision. Any reforms will be subject to consultation and scrutiny before the new funding models are agreed and implemented. Delivering the Better Births vision is reliant upon a wide range of organisations and stakeholders working together and embracing change to ensure high-quality services for women, babies and their families. Follow us on twitter – @NHSEngland and use our dedicated hashtags to follow and contribute to the conversation #BetterBirths #MatExp #SavingBabies. Watch out for Maternity Transformation blogs and bulletin issues. For general questions and queries, please drop us a line, england.maternitytransformation@nhs.net.